We have been working with trucks for a quick minute now. I mean this isn’t our first rodeo. A lot of times it trial and error what work well, What is top quality and what we here at Findlay Customs can put our name behind it. We found that the best liner to use is Bullet Liner. What makes the bedliner different to all the others is the material and the process. If you’re like most people, you don’t drive a pick-up truck because you have to. You drive it because you love to. It’s something you identify with. Sure, you want it to be tough, but you want it to look great also. Protecting your truck, while also providing our unique Bullet Liner attractive lifetime finish, which takes on the most extreme elements and still keeps your vehicle always looking good, is what we’re all about. 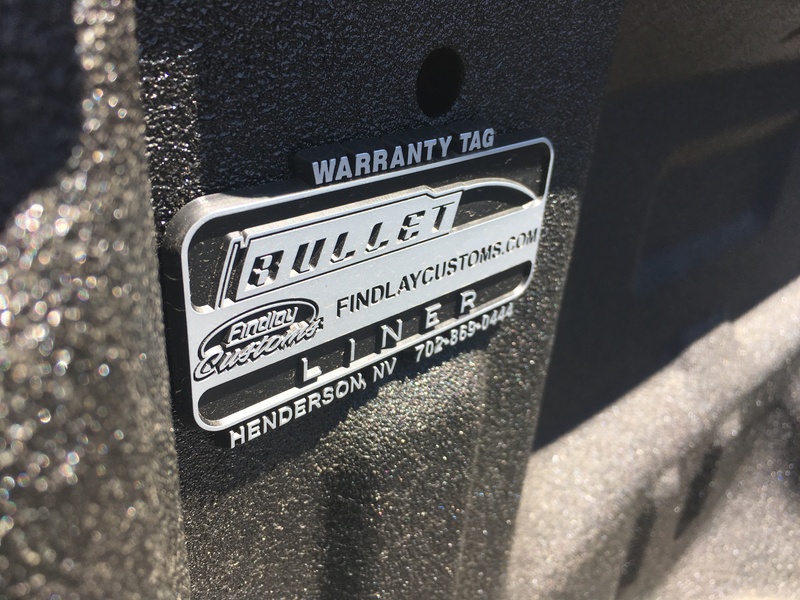 It started with truck spray on bed liner, but Bullet Liner’s High Caliber Protection can be used almost anywhere and in any color to prevent scratches, scuffs and even mitigate against dings and some dents. Bullet Liner also creates a grip tight finish that provides footing safety even on wet surfaces like trailer floors and boat decks. It almost doesn’t matter what it is. If you want it protected, we can coat it. Bullet Liner’s unique bullet tough coating can protect just about anything from the elements of weather, water, rust, corrosion and even everyday wear and tear. Our unique polyurethane protectant comes from the most technologically advanced formula and is engineered to employ an abrasion proof, water tight, custom spray protective sealant to just about any surface. Our team has provided this type of protection to the pentagon following 9/11 and to help provide a waterproof seal for the amazing fountains that grace the exterior of the Wynn hotel in Las Vegas. It doesn’t matter if it’s a large or small job, Bullet Liner takes protection seriously. Many construction workers transform their more comfortable work boots into tough and indestructible footwear that’s just as sturdy and resilient as steel toed/armored counterparts by coating them with Bullet Liner. It adheres to almost any surface. Not only does it offer safety benefits, but it looks great too. Vehicle that are sidelined and off the road due to exterior damage can cost significantly more than just a repair shop bill. They are the lifeline for many American businesses – and when they’re out of commission, so are you. A vehicle protected with Bullet Liner truck bed liner spray stays on the road longer. Our advanced technology spray-on polyurea protectant guards vehicles and cargo from costly damage, while also providing important safety benefits. Turns, hills and quick stops can all lead to dangerous cargo shifting, which can cause skids and potential accidents, increasing the potential for operator injury. At the least, this can potentially damage important cargo. Having a non-slip footing during loading and unloading is essential – and big rig flooring coated with Bullet Liner helps to improve overall safety and avoid accidents from falls by work crew. Especially favorable in wet conditions, Bullet Liner’s water tight sealant prevents rust and corrosion, extending the life of your valuable equipment. Bullet Liner adheres to most any surface and will provide a lifetime of superior protection and safety to most any application. Contact a dealer to find out how Bullet Liner can help minimize downtime and protect your investment.